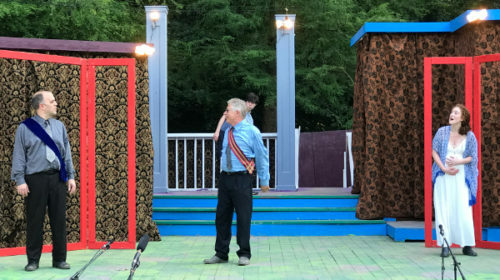 The Warehouse Theatre’s Upstate Shakespeare Festival under the tutelage of Producing Director John Fagan spins a valiant and thoroughly engrossing and entertaining “The Winter’s Tale” for its 24th summer season opener in Falls Park on the Reedy in Greenville through June 17. In this Shakespeare tale, King of Sicilia Leontes (played authoritatively and with precision by USF’s veteran actor Simon Crowe) asks his wife, Hermione, (Sarah Anderson) to convince his childhood friend and Bohemian King Polixenes (Dan Robbins) to extend his stay at the palace. Then, out of bi-polarism or plain ole jealousy, he accuses Hermione of adultery, imprisons her and orders his minions to destroy her newborn child. The play itself has stark contrast between acts, vacillating between light comedy and mirth and conversely, malevolence and utter cruelty by Leontes. At one point, “Winter’s Tale’ veers into Greek tragedy with an oracle, a child that survives and reconnects with the family, but culminating not as brutally as say the fate of Oedipus. In fact, the ending reveal is the perhaps the finest slice of theatricality in the staging. And the delightful Shepherd Shearing Feast dance is not to be missed. 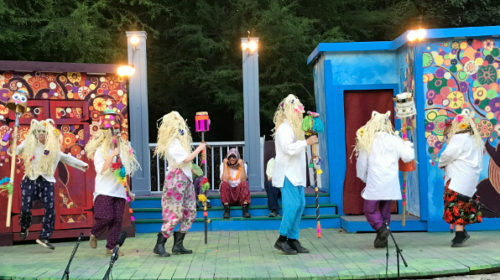 Some of the supporting players you will recognize too if you’re a regular outdoor Shakespeare connoisseur: Cameron Trieper as Camilla the Diplomat, Richard Beveridge as the Old Shepherd that discovers the infant and Lou Buttino (with an eyepatch) as Antigonus. 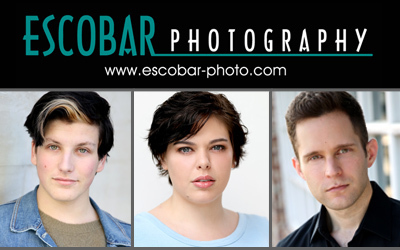 The cast also includes stellar showings from Chris Chamness, Sarah Nathanson, Mary Pochatko, David Neal Edwards, Hudson Meeks, Libby Hawkins, Bronson Delgado, Jaimie Malphrus and Charlie Stowe. Kelsey Kasianowicz is Production Stage Manager, Nathan Coffey is Stage Manager, John Carino is Technical Director and John Fagan and Rick Conner designed the clever set with secrets to reveal. This is the final weekend for “The Winter’s Tale.” Remaining shows are Saturday and Sunday, June 16-17 at 7 p.m. in Falls Park on the Reedy in Greenville. FREE. Donations appreciated. And don’t miss the wacky “The Taming of the Shrew” July 5-29 with performances Thursday – Saturday at 7 p.m.